A reading from the gospel of John 12:1-8. Listen for God’s word to us. So here we are: one week before all the passion and pomp of Holy Week. Next Sunday that amazing rehearsal of events we cherish begins! . . . The gospel of John has us on another day this last Sunday during the season of Lent: six days before the Passover. In other words, Sunday before the Friday of Jesus’ death. His last week among us before his crucifixion and beyond. . . . A lot can happen in one week. A lot will happen to Jesus, the Christ, in his last week. It’s something we so often miss. Things happen TO Jesus his last week and he lets it. We know he goes about doing a thing or two himself. Depending on which gospel you read, Jesus goes about everything from entering Jerusalem triumphantly, but humbly riding on a donkey as one would do in a time of peace, not on a horse heading out for war. Jesus weeps over this city – the ancient site of his nation’s religion and sovereignty. Jesus drives money changers out of the Temple his last week – according to the gospels of Matthew, Mark, and Luke. There’s his whole thing with that fig tree he tries to use as a lesson on fruitful faith. He prepares for and sits at table one last time with his closest disciples and friends. And then he goes out to the garden. Where in the chill of the night, he pleads his case before God. I imagine Jesus loved life. Every bit of it – from being in a human body, to connecting with other human bodies, to enjoying the beauty of this gorgeous world, to healing and helping whoever he could. Letting go of that’s not an easy process – not even for our God in-flesh in Christ, at least according to the gospel’s record of his prayers in Gethsemane. This is the point in Jesus’ life on earth as one of us when he really, really, really must trust in-full in God. He’s lived his lifetime letting go of his own desires in order to accomplish the work of God among us. And now, one last time, he must do what his words to Mary Magdalene will be after his resurrection. 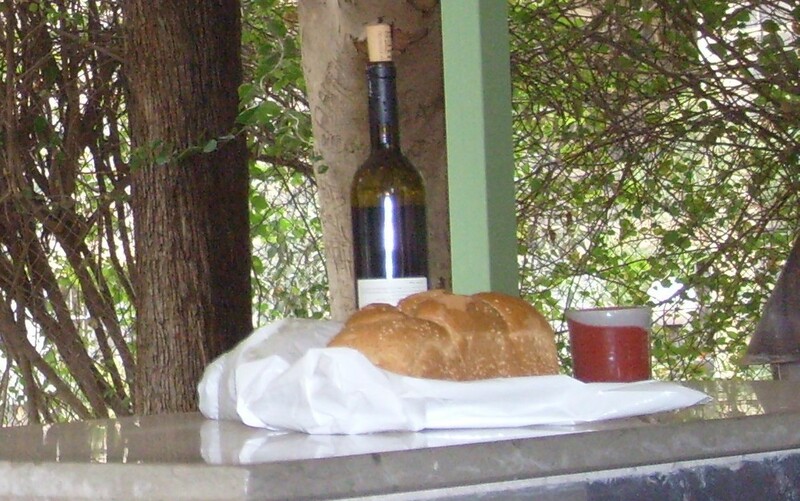 “Do not cling to me,” the Risen Christ speaks in the garden of Easter morn (John 20:17). . . . Do not cling to your life is the message Jesus first must drink in the garden of Gethsemane. Do not hold fast to your own desires, Lord Christ. Rather, let it be. Let it be with you according to the Way of the Creator of the universe. The pattern for all is life, death, then something new. . . . The gospels tell us that his struggle that Gethsemane night finally dissipates. He is ready to let events happen to him. Which is the meaning of the word passion – the pascal mystery of Christ. “Thy will be done,” at last he utters (Luke 22:42). Just in time for a guard, led by his beloved disciple Judas, to come take him away. He is ready. According to the gospel of John, Mary – the sister of Martha and Lazarus – knew. It should have come as no surprise really. He’d been telling them all along that it would be the path. And then, what he did there in Bethany just one chapter prior to the story we hear today, seals his fate – at least according to the gospel of John, which alone tells of Jesus’ raising of the dead man Lazarus. (And yes, I checked! The Greek word used for it IS the same that is used of the Risen Christ on Easter morning.) . . . The council was incensed. So many started to believe this Jesus really was somebody that the council felt the nation was threatened. He’d have to be put to death. That’s the only way they believed it all would end up ok. The worst failure of imagination on earth. They could not see another way for it all to be. . . . Mary knew. Imagine what was going on in her heart. We know that she and her siblings deeply loved Jesus. We’re not sure how they met – perhaps he stayed often at their house on his way to and from Jerusalem. What we do know is Jesus had been with them before. We also know that they all treasured each other very much. Imagine your dear old friend returns to your home, just a bit after he’s given you back your dead brother. You’ve heard the rumors, so you know this act is it. The higher ups will be on his tail until they nail him; you know. AND you know you are absolutely grateful – grateful for the gift of bringing your brother back from death. Mary and Martha’s lives depended on their brother Lazarus. We don’t hear of husbands or other surviving male relatives. They needed him alive for their own lives to carry on. Imagine the well of thankfulness stirring in Mary’s soul. Imagine the pit of sorrow stuck in her throat because she knew her brother’s life meant her Lord’s death. At the feet of such an extravagant gift, she seeks to give back an equally extravagant gift. At some point in the meal, Mary bends before Jesus. She takes out a huge amount of the most glorious, most fragrant, most expensive perfumed nard. She holds Jesus’ feet in her hands, rubbing the oils into what must have been calloused, aching feet from taking him all over their country and back. Tenderly she prepares these feet for the last steps they will take. The cold of the pit he’ll be held in at Caiaphas’ house. The pain of the nails that will rip through them. The dew they’ll at last feel again in the resurrection garden. Maybe she couldn’t know each step those feet yet would trod, but in an act of extravagant care, she does her part to prepare her Lord to die. She does not cling – she cannot. For she just has learned in the death of her brother how fleeting life is. How out of our hands life on this earth really is. It’s what he’s been trying to show every step of his journey. It’s the path we’re invited onto as he pleads, “Come follow me.” It’s the only way that ensures life – this way of self-emptying, of letting go, that something new can begin. It’s the only way that makes of our days anything important. Anything valuable. Anything of significance for anyone else in this world. The Way of self-giving love. Of setting aside our own way, and joining Christ in the prayer, “Thy will be done, O God. Let your pattern of life, death, and new life be cherished and trusted by us.” . . . That doesn’t mean our losses will be easy. Letting go – not clinging is so very hard for human beings. As we were reminded in our Wednesday night class this week: it’s ok to feel however you feel – it’s ok to cry in the face of death. AND, at the very same time, we’re invited to look beyond that moment. To see the Way of our God. . . . It struck me in a new way at one our retreats this past fall. Did God put the pattern all around us in this whole world to show us? Spring ALWAYS follows winter. Something new always grows. Always – no matter how severe the winter – no matter where you go on this planet. It might be more intense in some spots, but maybe, just maybe our Creator was trying to show us from the very first blade of grass on this earth. Maybe, just maybe, our work here is to be prepared. Prepared to move through the pattern of dying to self for God’s ways to be seen in us. Of holding on to everything – our lives, our families, our relationships with each other, even the stuff in our closets at home – never clinging. Hands open ready to let go and behold the unfathomable ways God can work. Maybe, just maybe like Jesus, and this Mary kneeling at his feet; we’re invited to heed the Risen Christ’s command: do not cling. For God makes a Way! As we enter these final days of Lent and all the passion of Holy Week that’s yet to come, may we find ourselves a little more ready this year. This entry was posted in Sermons and tagged 13 March 2016 sermon, Die to Self-will, Do Not Cling, John 12:1-8, Mary & Martha & Lazarus, Mary Annoints Jesus' Feet, self-giving love on March 15, 2016 by RevJule.